Garden decking is a great feature to have in your garden. It can serve many functions, and improve the appearance of the whole garden. However, in order for the decking to maintain its health and condition, it’s important that a suitable specie of wood is used. All material used for decking must be durable and resistant, but the wood also needs to be able to cope with the weather conditions that it is likely to be exposed to. What is decking good for? Not only can decking improve the appearance of a garden, but it is also multifunctional. One of the most popular reasons for having decking fitted is because it helps to create a homely and cosy atmosphere to your garden, and provides space for an outdoor seating venue – perfect for summer BBQs and other outdoor dining (when the weather permits!). As decking is built above ground, it is also an ideal solution for people looking to level their garden. Having decking can create a flat surface, and make the whole outdoor area appear much more finished. 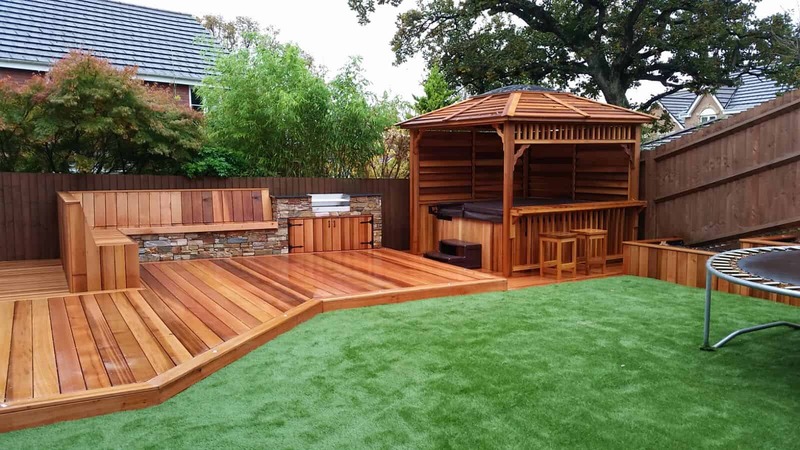 What type of wood is best for GARDEN DECKING ? Each individual project is different and has unique requirements that need to be satisfied, so difficult to state that one particular specie is the ‘best’ type. However, some species are better than others, and this is due to them having certain properties and characteristics. Get in touch with a specialist from the NORclad team today to discuss your project, and to find out the different types of species available to you. As the decking is likely to have people continuously walking on it in different conditions, it’s crucial that the specie chosen is durable and hard-wearing so that the health and appearance of the wood doesn’t quickly decline. It’s also vital that the type of timber that you use for your decking is suited to cope with the weather that it will be mostly exposed to. For example, if it is likely that your decking will often be in the sun, the timber you choose should have a good level of UV resistance. Here at NORclad, any of the species that we offer can be used for your decking project, This is because it is moderately durable and takes nails and screws well, making it ideal for assembling and constructing decking. The heartwood comes in a reddish-brown colour, whereas the sapwood is usually a creamy-white to yellow colour, but the specie can be stained, varnished and painted to a satisfactory level if a different colour is required. British Sweet Chestnut is another popular option to use as the specie for exterior decking and cladding – and for good reason. Not only does it offer a lovely golden colour (similar to the colour of oak), but most importantly, it is a durable material. Its hard-wearing and strong properties make it an ideal material for decking, and it can be cut and nailed to suit individual requirements. However, if it isn’t protected with a good quality semi or fully translucent UV-radiation protective coating, it will naturally weather to a silver colouring. 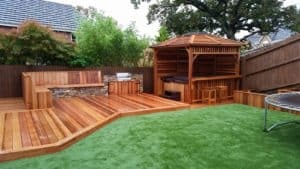 On the other hand, a considerable amount of people choose a softwood specie, such as Canadian Western Red Cedar, to use as the material for their decking, especially when weather resistance is of high importance. Although it is aesthetically pleasing and usually cheaper than other types of timber, it is considerably softer than European Redwood and easily damages. A finish has to be applied as soon as it is installed. so that discolouration of the timber can be prevented.which requires ongoing maintenance and comes at an extra cost. Are wood composites good for GARDEN DECKING ? Although we don’t offer composite products. Another material that can be used for decking is composite wood. which is comprised of different wood fibres. The mixture, also known as engineered or man-made wood. Doesn’t appear like natural wood and is more likely to absorb water, increasing chances of wood swelling and cracking.